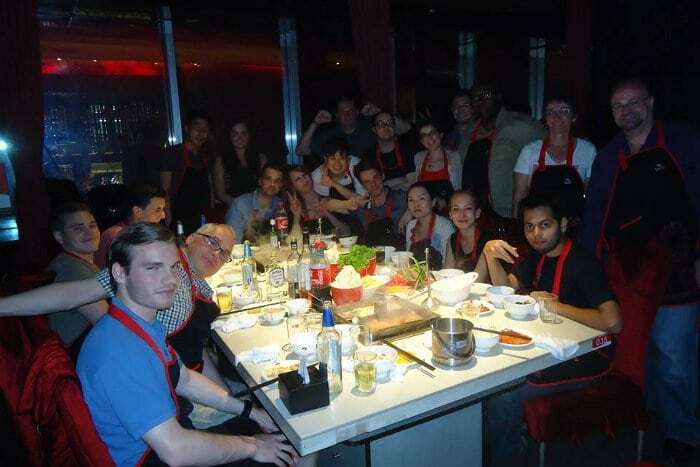 After graduating I decided to spend a few months in China. I had already been to Kunming in the summer of 2013 for an intensive Chinese course in a private school, but two months seemed too short and I wanted a different experience that was more than just studying. So I began looking around for an opportunity as an intern. With all due respect for agencies that offer internships in China where it is the intern that has to pay thousands of Euro to work, I wanted something different, to try and find on my own the internship that was best suited to me. On the German chamber of commerce site I came across an internship offer with a language school, unpaid, but at least it was free. The school was looking for a native-speaking intern to translate and optimize their site in Italian and handle their Italian contacts. In exchange they offered a four weeks intensive Chinese course. Since translating in the marketing field is one of the sectors that I would like to specialize in and since I wanted to spend a few months in China studying the language without spending too much, I immediately applied. The procedure was the usual: motivation letter and CV, exchanging mail, interview via Skype. Once I got the internship I started working on the problem of where I would live for four months in Beijing. 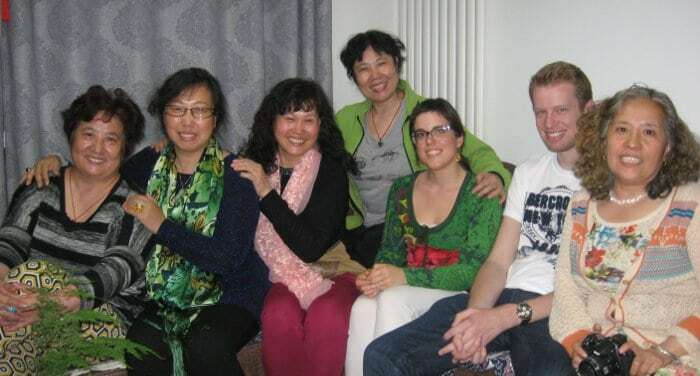 Since I didn’t have any contacts I turned to the school, which arranged for apartments shared by students and organized, for those who wished, the so-called “full immersion” program: placement with a family that speaks only Chinese, with meals and lodging included. An excellent way to learn the language better, discover the culture and understand the Chinese mentality. When the school offered me the full immersion experience I said yes without a second thought. I’m used to living alone and am the type of person that finds fulfillment in solitude and complete freedom in it. I love my independence, minding my own business, preparing my own food, going out at night without anyone asking me when I’ll be back, staying on Skype without anyone calling me because dinner is ready. I knew that living with a Chinese family would be the exact opposite. The Chinese love control: from my experience at the Chinese school the year before I recalled that if the students (average age about 40 years old) went somewhere else on the weekend they were required to inform the school of the address where they’d be spending the night and the exact hour of their return. I was afraid of having to render an account for my every move to the family, come home by certain times so that they wouldn’t get worried. And since I had intentions of doing much touring of the city on my own, this created problems for me. Do you find it amusing that I list this as the second point? I won’t go on writing about Chinese public restrooms, I’ll just say this: no doors in front of the bathroom, people who do their business with the door open, no Western toilets anywhere (always Turkish, at times not only in public bathrooms but in budget hotels as well). Not knowing how a Chinese family lives I was afraid that some of these customs would be adopted in private homes but I was ashamed to ask the school for clarification on this subject. Before leaving I equipped myself with VPN to be able to access social networks. However I knew, again based on my experience the year before, that the internet connection in China is pathetic, especially when you try to open a foreign site, with or without VPN. I was afraid of not being able to keep in touch with family and friends, as well as important work contacts. Sadly, as I’ll go on to explain, I wasn’t off by much. Fried cat meatballs at breakfast? Rotten egg and turtle stew at dinner? No, my fears didn’t amount to much. I remembered that Chinese cuisine, rich in regional variety, is much better than what you’d think. I also imagined that my host, accustomed to hosting strangers, would have cooked things in a more western style. But I also knew that the Chinese love fried food. I keep to a healthy diet and the idea of eating junk (in the sense of unhealthy food, even if it is tasty) for months did not appeal to me. In any case I knew that I wouldn’t be seeing my cup of yogurt and grains at breakfast for a good while. I was afraid of offending my host by saying or doing things that, even if they’re normal in our culture, in China are considered in bad taste. I didn’t have a problem cutting down my space, but I had to say goodbye for awhile to the freedom I enjoyed. Liu, my Chinese mother, is very curious, and often asks me what I did during the day, what I bought and how much I spent. Once I tell her the price she responds: “Too expensive! You should have talked them down!” Often she tries to convince me to do certain things rather than others, or go to certain places rather than others. If I think she might be right I’ll listen to her; most times I do my own thing. If I’m out late at night she waits for me on the couch with the light on, turning it off once I come home. At times I come home earlier than I’d like, just so that she doesn’t worry: to me it is a sign of respect and spending the night in a disco with other expats is not the reason I came to Beijing. All in all I think its possible to limit one’s own independence for the sake of an experience like this. Much better than I feared. Western toilet and very clean, like the rest of the house. When you use the bathroom you close the door and do not open it while others are there. It is even possible to throw toilet paper into the WC and not in the little basket nearby. What a luxury! I have noted however, even in other homes, that it is the least important room in the house. There are almost never windows and often, even in the most modern apartments there’s no shower box: which means that the bathroom floods every time you take a shower. Here is where we come across a sad note. There’s wi-fi at the house, but the connection isn’t strong enough to make a Skype call as God intended. My friends that call me say that it is like calling the moon. During a twenty minute conversation the connection will cut off at least four times. But this isn’t a problem with the host family, even in the school where I work the wi-fi leaves much to be desired. Meals with my hostess Liu are the most enjoyable moments of the day. They are an occasion to speak, socialize and recount many things. The food is excellent, and above all varied. 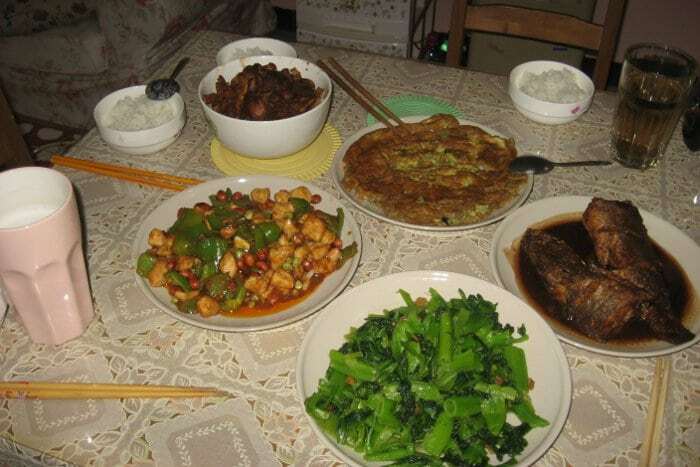 In China two or three different dishes are always served. Liu forces me to eat more than I reasonably can. I don’t understand how it is she thinks I could manage to eat so much. As soon as I say that I’ve eaten enough the typical response is “that’s not true, you’re just worried about getting fat. You girls are all the same, if only you had experienced hunger the way I did when I was little!” Or else she points out how good and healthy the things she cooks are. She’s probably right, the food is light and I’ve only put on a little weight (just two or three kilograms). Every once in a while, without meaning to, I’ve said something that has offended them. In fact, I get the impression that they’re deeply offended if I’m unable to finish the mountain of spaghetti egg and tomato that she serves me, even if I solemnly swear to do so the next day at breakfast (something I’ve yet to do!). In general though we get along very well. The more you eat, the happier you’ll make them, but beware: don’t make the mistake of asking for a second serving of spaghetti if you’re already full and say you’re full before you explode. Caterina Saccani is a translator and interpreter. 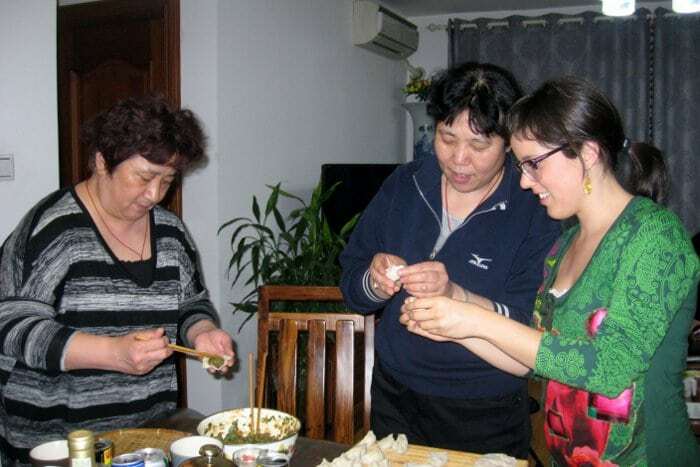 She currently lives with a Chinese family and works as an intern with LTL Mandarin School of Beijing.